On May 27th in 1993, Wayne Gretzky cut Doug Gilmour for eight stitches with a high stick during overtime in Game 6 of the Campbell Conference Final. The unpenalized play left the Great One on the ice to score the winner moments later. Referee Kerry Fraser's historic non-call, which haunts him and leagues of Leafs fans to this day, invited conspiracy chatter to Don Cherry's Coaches Corner with Torontonians claiming the NHL influenced officiating to ensure Los Angeles would advance to the Stanley Cup Finals. NHL Director of Officiating Brian Lewis later spoke with HNIC host Ron MacLean to discuss the events surrounding the Game 6 non-call. 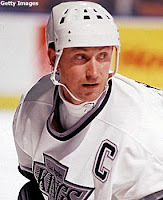 Gretzky collected a hat trick in Game 7 at Maple Leaf Gardens leading the Kings to a 5-4 win over the Maple Leafs and their franchise first trip to the Stanley Cup Finals, which they lost 4-1 to the Montreal Canadiens.